During a 90-minute podium discussion on democracy and global responsibility, Obama spoke of the need for the renewal of the international order against the background of xenophobia, nationalism, intolerance and anti-democratic trends. “We have to push back against those trends that would violate human rights, or that would suppress democracy, or would restrict individual freedoms of conscience and religion,” said the former US president. “We can’t isolate ourselves. We can’t hide behind a wall,” Obama said, speaking at the place where the city was once divided between East and West by the Berlin Wall. Organized every two years in a different German city, the Kirchentag this year has gathered more than 100,000 participants of all ages in Berlin. “We hope the Kirchentag will promote a holistic vision of justice and peace that addresses the dynamics of conflict in different regions, the impact of foreign powers and changing global realities such as economic globalization, migration and climate change,” said Dr. Agnes Abuom, moderator of the World Council of Churches’ (WCC) Central Committee. 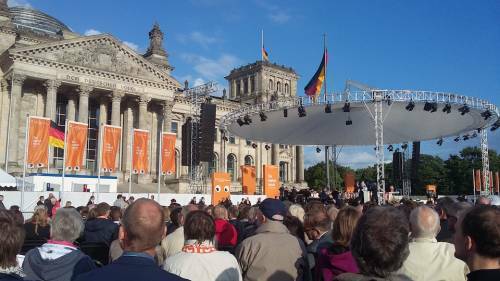 Abuom is to speak to speak at a Kirchentag podium on responsibility for peace with German foreign minister Sigmar Gabriel, one of the 2,000 events during the Kirchentag, many of which involve representatives of WCC member churches from several continents. Bringing together figures from church, political, economic and national life, the Kirchentag serves as a major forum for debates on current social and political challenges, as well as offering opportunities for worship, music and culture. Meeting from 24-28 May, the Kirchentag falls in the year of the 500th anniversary of the Reformation, and is one of the main events in Germany celebrating the jubilee. It concludes with a televised service in Wittenberg, the town about 90 kilometers away that is celebrated worldwide as the place where Martin Luther’s Reformation began. Organizers hope the impetus of the Reformation will help face challenges such as the integration of refugees, climate change, and financial and economic governance. The Kirchentag will observe one minute’s silence on 26 May for the more than 10,000 people who have lost their lives on their journey to Europe, fleeing war, hardship and terrorism. Founded in 1949 by Protestant lay people in Germany to strengthen democratic culture after the Nazi dictatorship and the Second World War, the Kirchentag has gained European and global reach in recent decades. This year there are more than 6,000 foreign participants from 105 countries – a record, say organizers. Addressing the Kirchentag on the opening day, the Archbishop of Canterbury, Justin Welby, the spiritual leader of the worldwide Anglican Communion, spoke of the terror attacks in Berlin before Christmas and in Manchester, Britain, two days before the opening of the Kirchentag. “We pray, we mourn, we lament, we cry out, we protest,” Welby said, in an address described by organizers as the first to a Kirchentag by an archbishop of Canterbury. 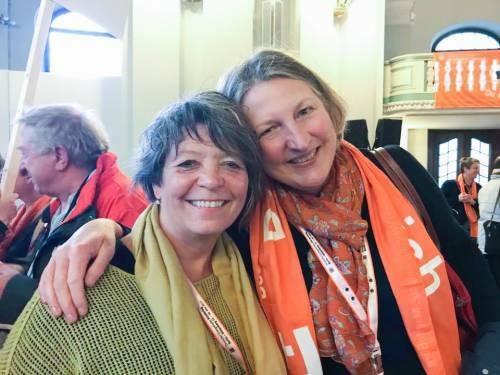 Alongside Abuom, other members of the WCC leadership speaking at Kirchentag events include the general secretary, the Rev. Dr. Olav Fykse Tveit; the WCC president for Africa, the Rev. Mary-Anne Plaatjies van Huffel; and other members of the WCC Central Committee.